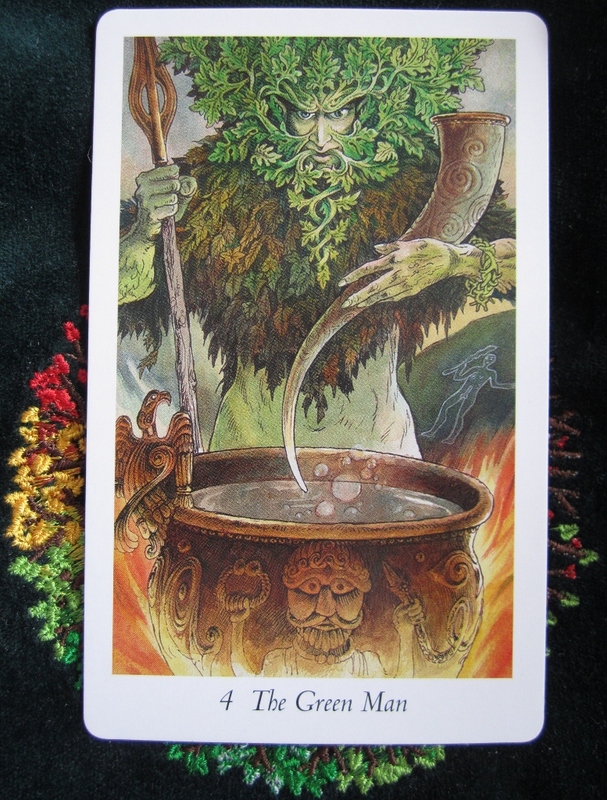 And on this Friday, Priestess Tarot pulls out the Fourth Major of this deck, The Green Man. This card is the Emperor in RWS decks. He’s quite masculine, driven, assertive, sometimes commanding and sometimes harsh. You get some tough love from The Green Man but he is protective, fertile, creative and fatherly. To me, the Green Man is Herne the Hunter, one of the deities I usually work with, and I’ll be calling on his strength tonight. But for now, what is my message for today? The message today is to enjoy being at the top of my game, being confident and assertive. It is also a day for giving and receiving the natural order of things, to begin new projects, relationships and lots of other new things that are promised for today. What a brilliant card to pull out on a day of a Tarot party! !